Even if you weren’t intimidated before, that tidbit is probably enough to make you reach for the Excedrin. 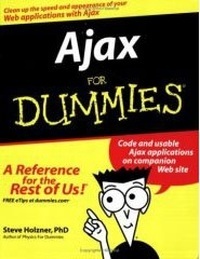 Just reach for Ajax For Dummies instead. With screen shots, actual code and explanations, and live Web sites where you can see Ajax applications doing their thing, it will have you using Ajax to create Web applications that look an act like desktop applications in no time. With Ajax, you can speed up and clean up your Web applications. Shoppers at your online store can fill their carts without waiting for multiple page refreshes. Searchers on your sites can get instant results on the same page.